This statistic shows the result of a survey on Finns' opinions on Donald Trump's influence on environmental protection as of June 2018. 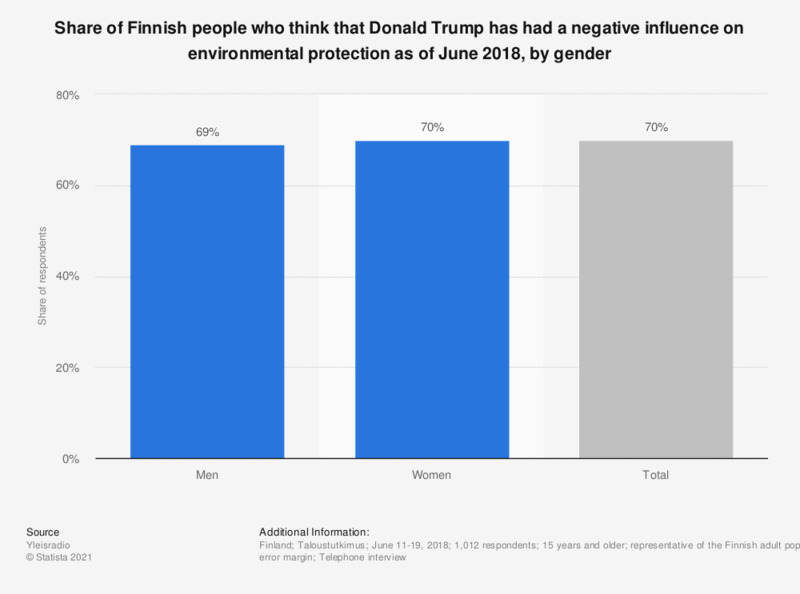 According to the survey, 70 percent of survey respondents (representative of the Finnish adult population) believed that Trump has had a negative influence on the environment protection. The survey was conducted prior to the Helsinki Summit where Donald Trump met with the Russian president Vladimir Putin on July 16, 2018. Survey respondents were asked on which factors, in their opinion, Donald Trump has influenced. This question was phrased by the source as follows: "Heikentänyt sitoutumista ympäristönsuojeluun." Did you change in the last year your habits in order to reduce the environmental pollution? Would you like nature protection issues to be present and addressed by the candidates during the presidential campaign?